Aluminum Travel Case for safe transportation of cannabis(-accessoires), decorated with Amsterdam Genetics colors and logo. 100 Empty Jack-Pods to fill at home. To use in combination with the Amsterdam Genetics Weezy and Fill-It. 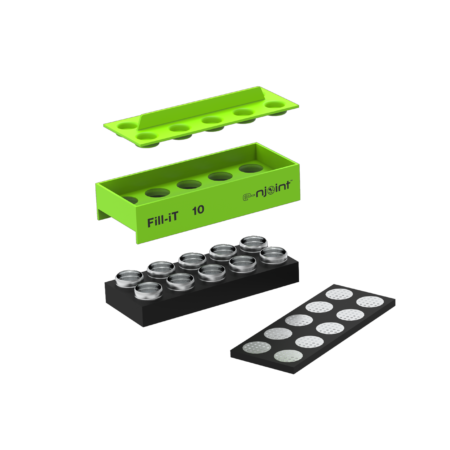 Fill up your own Jack-Pods to use in combination with the Amsterdam Genetics Weezy smoking pipe, with the easy-to-use Fill-It 10. Always keep a fresh smoke at hand thanks to the Jack-Pod Stash Tube, including four refillable Jack-Pods. 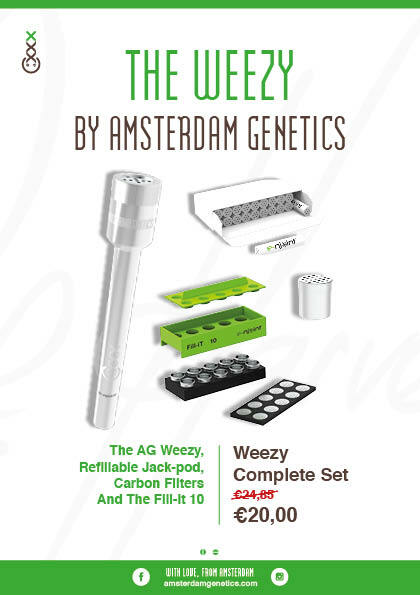 Discretely stashes up to four Jack-Pods for the Amsterdam Genetics Weezy. Replacements for the Weezy Carbon Filter. 20 High Quality active carbon filters (6mm) for the Amsterdam Genetics Weezy Smoking Pipe. Stylish aluminum herbal smoking pipe with active carbon filter, to use in combination with the pre-filled or refillable Jack-Pod. Includes one refillable Jack-Pod and one carbon filter. The Amsterdam Genetics Silicone Hash Holder is the perfect way to keep your concentrates like sticky hash and dabs clean and fresh. The BIG silicone box measures 55mm in width, the SMALL silicone box measures only 47mm in width. The Little Green Bag available exclusively from Amsterdam Genetics is the perfect place to keep your smoking supplies. Resealable pouch with adhesive areas to keep your tips and papers secure. Our three piece acrylic grinder is an ideal choice for grinding and keeping your herbs safe. The two sections are held firmly together by magnet. Meaning losing your ground herbs in your pocket is no longer a problem. Clippers Lighter from Amsterdam Genetics. Branded with our own world famous logo. Refillable and including handy custom Clipper bit. The Little Green Bag available exclusively from Amsterdam Genetics is the perfect place to keep your smoking supplies. Resealable pouch including Tips and Papers. Our three piece plastic grinder is an ideal choice for grinding and keeping your herbs safe. The two sections are held firmly together by magnet. Meaning losing your ground herbs in your pocket is no longer a problem.